Southampton's excellent South Coast location means that travel links by road, rail, sea and air are unmatched in the region. Further travel information can be found on the Travelling to Southampton link. 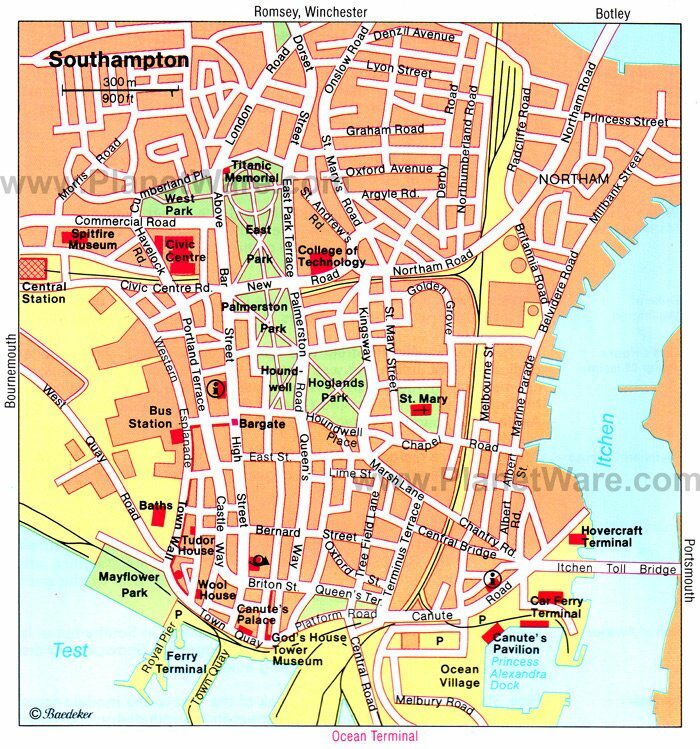 Details and maps of Southampton's four cruise terminals. Taxi fares to town are about 5 pound. It is about a 5 minute cab ride to the train station. You have the option of four departures an hour and journey times of 70 to 90 minutes to London. Some hotels have special cruise packages, which include parking! Discover Southampton's Old Town, one of the gems of England. A place, with some unique features, that has played its part in the country's history and that, for diverse reasons, attracted the interest of William The Conqueror, Henry V, William Shakespeare, the Pilgrim Fathers, Isaac Watts and Jane Austen. Walk in their footsteps seeing buildings that span centuries of time, be captivated by the spell of very impressive medieval town walls that rival any to be found in England and wonder at The Bargate, one of the country's finest medieval town gates. See the church in which Philip of Spain heard Mass before riding to Winchester to marry Queen Mary in 1554. Be thankful that you are not trapped beneath the fiendishly defended West Gate. Near here both Mayflower and Speedwell were berthed in 1620 when the Pilgrim Fathers were at Southampton and had no inkling that they would be making an unscheduled stop at Plymouth. Find out the fishy story of why Tudor Merchants' Hall was moved. See places that Jane Austen and her family knew, including the wide variety of architectural styles within a short distance in Bugle Street. Go back in time at award winning museums, in historic buildings, to see how people lived here in past centuries and why the loss of the Titanic had such a devastating effect on Southampton. Within a short distance of the Old Town is the waterfront, peaceful now with cruise ships and container vessels that are such a feature of Southampton, but once of vital importance for the D-Day landings. Solent Sky, with its wonderful display of historic aircraft, is nearby. With no shortage of places to relax, eat and drink. Taxis are plentiful and metered, but often refuse short trips. Taxi to the town center and train station about 8 pound. London is an hour and a half away by train. At the train station also the national express bus departs for London and Heathrow. Salisbury / Stonehenge - Half-hour train journey, every 30 minutes, to the laid-back cathedral city of Salisbury. Ho-ho bus from there to Stonehenge (ho-ho round-trip one hour travelling, and allow one hour at Stonehenge). Winchester - 20 min train journey, 2 to 3 per hour, to the ancient capital city of Wessex, walk down through the city to the cathedral, etc, perhaps taxi from King Alfred's statue back uphill to Winchester rail station. Beaulieu Abbey/National Motor Museum & the New Forest - 10-minute ferry across Southampton Water from Town Quay to the village of Hythe (Hythe, Hampshire, not Hythe, Kent), 6 mile taxi ride to Beaulieu, just in the New Forest. There are a number of ferries, some faster than others, that run between Southampton and Cowes (Isle of Wight), and a day trip is possible.